OCEAN BEACH, CA. There may be a Santa Claus after all – if you like fire pits and rings at the beach. The California Coastal Commission has just informed the City of San Diego that it will need a permit from the state to remove the the fire rings in Ocean Beach, and the other beaches – Mission, PB and La Jolla Shores. Mayor Jerry Sanders has proposed removing the 186 fire pits in order to save bucks on their maintenance as he grapples with a 179 million dollar deficit. The last-minute hero that bonfire fans are looking to this time is the California Coastal Commission, the state agency charged with protecting the coast and recreational opportunities there for the public. The 186 fire pits have been a colorful aspect of the city’s growing budget woes since Mayor Jerry Sanders proposed removing them late last year to save on maintenance. The coastal regulator has not previously intervened, even though at one point the city rolled out heavy machinery to start extracting them. 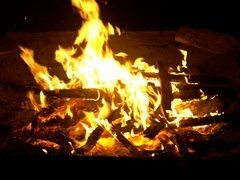 The commission has now informed the city that it will need a state permit before removing the concrete squares that warm marshmallow-roasting families and late-night partyers in Mission Bay, Ocean Beach, Mission Beach, Pacific Beach and La Jolla Shores. Coastal Commission decisions can become drawn-out, bureaucratic affairs. But city officials said they have involved their lawyers in the belief that no permit will be needed and that, if a permit is necessary, approval will be quick and easy. Go here for the remainder of the story. people – we are losing a piece of our beach-based culture. it’s not like no one cares, but when they’re closing libraries (almost) and shuting down government services, who’s gonna bat an eye at the loss of fire pits. but that early evening you want to go down to the beach and roast marshmellows and werners with your kids …. oops! they’re not there. why can’t we have sponsorships of fire pits like caltrans has sponsors for maintaining sections of the freeways? really, why not? or bottom line, why can’t we just have firepits and let them go un-maintained – so what? so there’s some burnt wood in the pit you want to use? so what? it’s really crasy over how little we have control over our lives and culture. fire pits have been around most of a century and you’re letting them be taken out. amazing. what are you going to tell your kids when they figure out that they were taken out on our watch? OB needs a firepit Czar. Someone to underbid the current cost of maintaining the firepits…un underbid that the city can’t refues. I find it hard to be happy about funding a fight between two bureaucracies. How much could it possibly cost the city to maintain fire pits? Do they clean them every day? If we had a section of the beach partitioned off where responsible residents could pay for a license (subject to be revoked if abused) to drink on the beach the money raised could pay for the cleaning of the fire pits. Basically, I will pay for personal freedom as long as the money goes for the greater good. Paying for freedom? Nothing left to lose I guess. Local beach areas will be put in control of rings in their respective areas. obsteven – it’s a little over $200k. justmy2cents – you’re right there! people: i already made a great suggestion: let’s have sponsors of each firepit – private individuals or companies – like caltrans does for sections of the freeways. so the sponsors get a paper tag slapped on the fire ring with their name on it. the fire rings stay open. now, please get behind this idea, and call councilguy kevin faulconer’s office at 619-236-6622. Why not the OB Rag? Paper tags? Genius. Then you can sell the same fire ring over and over again. brian, c’mon, instead of poking fun (and holes) in my idea, why not help with the idea itself. bodysurferbob – ready to do a rant, dude? contact us via our email and we can set ya up.